We, the International League of Peoples’ Struggle, condemn as intolerable acts of aggression by French imperialism the military operations being carried out by French fighter jets and commandos in the north and central regions of Mali under the pretext of fighting “Islamic terrorism”. We likewise condemn the complicity of the US and other imperialists. 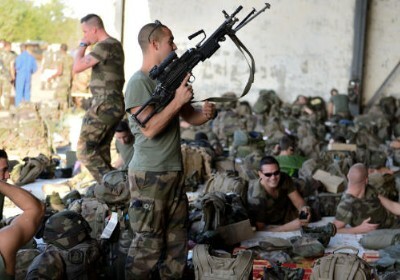 In carrying out aggression, France has been emboldened by the Obama administration’s declaration in December that the US would dispatch 3,500 troops to 35 African countries, and by the involvement of the US, UK and Denmark in bombing raids in Mali. And the UN Security Council is once more being used by the imperialists to endorse and support aggression. Indiscriminate bombings have killed and wounded hundreds of people in the cities of Gao and Konno, and in other areas. In Douentza in central Mali, victims have been prevented by bombs from reaching the local hospital. The bombers attack the people they see in the streets. The real objective of the imperialists is to seize the oil reserves in the center and north of Mali. Fighting the “Islamic terrorists” is a mere pretext. In the aggression to overthrow Gaddafi in Libya, the imperialists armed even those they would otherwise call “Islamic terrorists” because the objective was to seize the oil resources of Libya. Since more than a year ago, the Tuareg people struggling for their right to self-determination have sought to secure an autonomous regime in the north of Mali. The Movement for the National Liberation of Azawad (MNLA) was able to take control of cities in early 2012. Subsequently, Islamic groups took their own initiative to take control of key areas around Gao and the city of Timbuktu. As a result of the victories of the MNLA in early 2012, the government in the capital of Bamako in the south went into turmoil. Capt. Amadou Sanogo, a US-trained military officer, led a military coup in Bamako, overthrowing President Amadou Toumani Toure. Since then, the government has become unstable despite the close ties of the US Africa Command with the military, which depends on the US for training, arms and funding. The interventions of the US and France in the internal affairs of Mali and the French acts of aggression will continue to arouse popular resistance and weaken the government in Bamako. A big number of the military officers and men of the central government have joined the resistance. France is faced with the prospect of being trapped in Mali in a way more dangerous than in Iraq, Afghanistan or Somalia. We, the ILPS, are consistently opposed to imperialist aggression because this violates the national sovereignty of the people and the territorial integrity of a country. This serves above all the economic, political and other interests of the imperialists, unleashes wanton destruction of human lives and the social infrastructure, and inflicts terrible suffering and hardship on the people. We demand that the imperialists withdraw from Mali and stop their bombardments, troop movements and slaughter of the people. We stand in solidarity with the people and support their struggle for national and social liberation. We are confident that, amidst the turmoil in Mali, the people take their destiny into their own hands and defeat the imperialists and local reactionaries.